Striata Spotlight Insights Should you consider industry standards for Open and Click rates? You have probably considered searching for industry statistics on open and click rates, in an attempt to measure your email marketing campaigns, but is this the best option? In our first issue of eMarketing Insight for 2012, we discuss the factors that influence open and click rates and the best way to measure them. While wanting to benchmark your campaign results against an industry average is understandable, it is somewhat misplaced as no two target audiences, campaign messages or commercial relationships are the same. Have you historically provided relevant and valuable content, so as to build a trust relationship with the target audience? Is the offer/message in this campaign relevant to that recipient, at that moment? Can you slice through the inbox clutter ? Click-through rate is also influenced by the above factors, especially if customers already have a relationship with the brand, they’re more likely to click through on a call to action that interests them then. Is the action required to take up the offer clear and simple? Have you tested what day of the week and time of day gets the best response? People read emails in a specific way. To achieve the best possible click through rate, have you tested which layouts produce the highest response? Because no two campaigns can have identical elements in each of the influencing factors, the usefulness of an ‘industry standard’ is questionable. 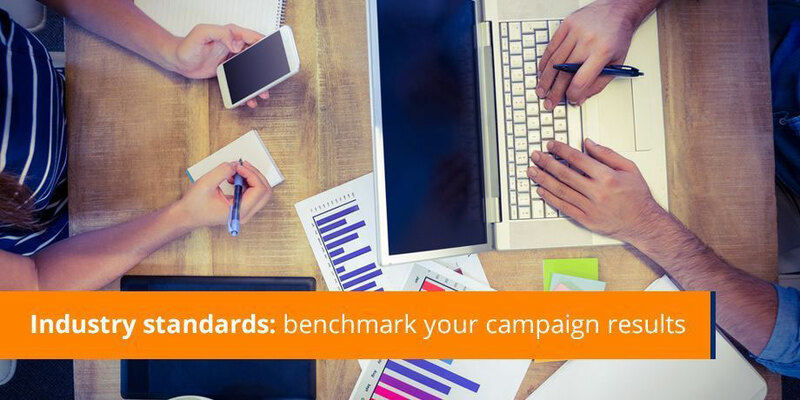 A better approach is to create your own benchmark by measuring your campaigns against the contributing factors and then strive to improve on those rates. This will also drive the right measurements, as well as shape your split-test plan. For example; if October’s newsletter beat all your previous open rates – record what you did, and test that approach in your next edition. This way, you are constantly aiming to improve on your own measurements. But make sure you always measure the rates in the same way, otherwise the exercise is pointless.